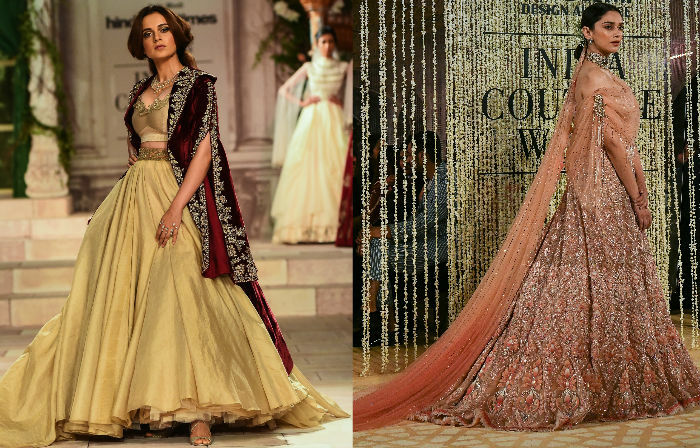 Kangana Ranaut and Aditi Rao Hydari owned the India Couture Week, held in New Delhi on Wednesday, as they walked the ramp dressed in fabulous creations by Anju Modi and Tarun Tahiliani, respectively. Kangana Ranaut closed the show wearing Anju Modi's Victorian era inspired ensemble. Speaking about Anju Modi's collection, Kangana told IANS: "I felt a little choked that it was so romantic, but painfully romantic." Anju Modi joined Kangana on stage. Meanwhile, Aditi Rao Hydari wore Tarun's show-stopping piece - a Swarovski-embellished lehenga with a gossamer veil. A contrast choker complemented the lehenga. Tarun Tahiliani and his muse.